It’s funny: 2016 gets a bad rap for being horrible, and I largely agree with all the grim assessments I have been reading these last few days. However, 2016 was also the year that both my children were baptized into Christ. Luke became a Christian on October 19, and Anna followed suit on December 15. That means that as we enter the new year, we enter it as four Christians. That thought shocks, humbles, and motivates me. Raising my kids has always felt like a huge responsibility, and even before they were baptized, I felt the burden to always point them to God and to lay a strong spiritual foundation for them. Now that they are officially Christians, however, my call to disciple them feels even stronger. And I instinctively know what I want to do to introduce them to the Christian life. I want to introduce them to the spiritual disciplines. Like the year 2016, spiritual disciplines have a bad reputation sometimes, conjuring up images of monkish mortification and pointless, taxing exercises. 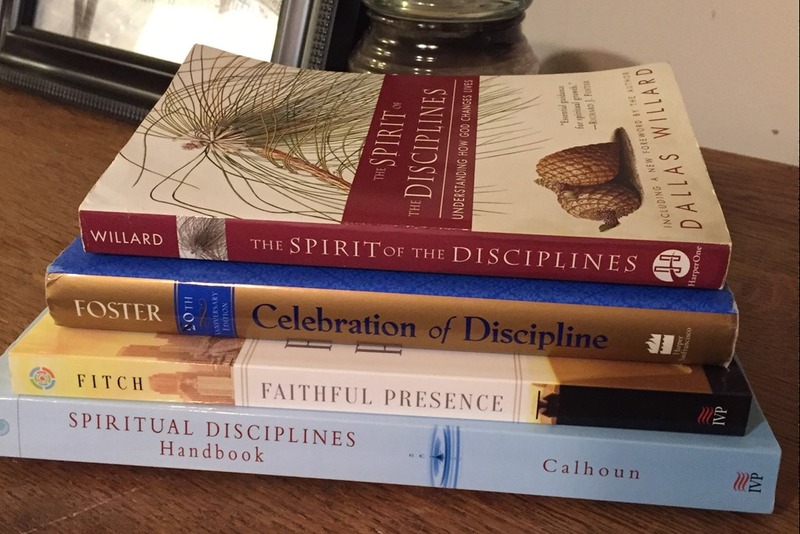 However, I’ve been drawn to them ever since I first read Richard Foster’s landmark Celebration of Discipline a few years back, and after finishing Dallas Willard’s incredibly thorough and rational Spirit of the Disciplines last week, I am a total advocate of practicing disciplines. In fact, Willard’s manifesto (and that’s really what it was) made me realize that the widespread lack of practice of the disciplines is most likely behind one of my biggest faith challenges: the fact that most Christians I know are not radically different—or even different at all—from their non-Christian neighbors. I remember asking my dad desperately once while in college, “Dad, if Christianity is true, why doesn’t it catch on more? Like, when people become baptized, why don’t they change? Why haven’t I changed more? I’m supposed to be ‘transformed.’ I don’t feel transformed.” Reading the Bible all the way through for the first time in 2006 increased my angst on the subject: as I powered through the New Testament in 2 1/2 months, I saw so clearly that my life looked nothing like the lives of Jesus, His disciples, or the early Christians. As you might imagine, this dawning awareness was profoundly depressing to me. When I asked my dad my faith-shaking question, he told me that I was underestimating the power of sin. I think he was totally right, and Dallas Willard would agree. In his book, he argues that reason today’s American Christians do not, for the most part, follow the example of Christ as laid out in the sermon on the mount, is because we don’t pattern the rest of our lives after Him. Unlike Paul, we fail to practice the day to day style of living that He practiced, which heavily involved spiritual disciplines such as prayer, solitude, and fasting. Willard—who really is eminently practical—argues essentially that you practice how you play, and Christians today don’t practice. He describes the disciplines as a “curriculum for Christlikeness” that help to train our bodies and minds so that we can fully participate in the kingdom of God. And in my own life, I have found the disciplines very helpful in doing just that: bringing me closer to God and training my responses. In that light, how could I not introduce the disciplines to my children? They should be seen as Discipleship 101! Furthermore, as a homeschooling mom I emphasize the importance of discipline in so many other areas—academics, physical exercise, diet, hygiene, cleanliness—that my kids take it as an article of faith that discipline is good for you. So why wouldn’t spiritual discipline fall into that category? After my reading of Foster and Willard—not to mention Matthew, Luke, and Paul—spiritual disciplines seem like an important first step for any new Christian. Thus, our family is going to take a month to focus on each of the twelve disciplines that Foster covers in his book. We will start off in January with prayer, and I will probably have a separate post about what we do and the resources we use. Which brings me to the whole point of my blogging about this. First of all, I feel weird writing about it at all. For one, I’m pretty sure that secrecy is a spiritual discipline, and this blog post kind of feels like I’m shouting from the rooftop this “holy” thing I’m doing, which feels super awkward to me. However, something I’ve long been convicted of (and you can confirm this with my husband and best friend, who have been subject to many of my angsty moanings on the topic) is that I need to use the tools around me to better serve the kingdom. What I mean is this: I am forever putting together resources to help my family and my church grow closer to God. But in this technological age, it would be so easy to make those resources available for anyone who wanted them. For instance, I have a fun Thanksgiving devotional, I have an Advent family reading calendar, I have several things like that, things that might be helpful to others. And I need to share those things. SO…I plan on developing some resources to introduce the spiritual disciplines to my own kids, and I think they might be helpful to other interested parents. From my own searching, I see that there’s not a ton of stuff out there on spiritual disciplines for elementary-aged kids, and I’d like to make some things available. And at the very least, maybe in following our journey through the disciplines, other parents might get their own mental wheels spinning about creative ways to disciple their children. I think that sometimes with all the other stuff we have to worry about in parenthood, nurturing our children’s spirituality falls by the wayside. So if this is something you are struggling with, know that I’m right there with you! And if you have any ideas for me, please share them. We Christian parents are definitely in this thing together, and I pray that whatever your approach, 2017 will be a year that brings every member of your family closer to God. Can’t wait to see what God does with this passion. I can’t wait to see the materials you create to help me teach my own kids learn the disciplines this year (because of course, since our discussion I see the need to encourage that same focus). Love the words! I am excited to see what you share!! !